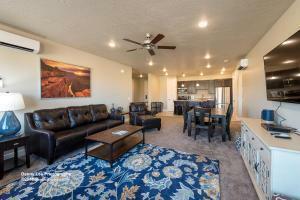 Enjoy Sand Hollow Resort condo living, or use as a vacation rental. Sit out on the patio or inside and look at the beautiful views of golf course and red rock mountains. 2 bedrooms, 2 baths, spacious kitchen, large great room perfect for entertaining. Nice furnishings is set up to sleep 8. After a day on the golf course, the lake, dunes, hiking, relax at the pool.Seller will pay 1st year HOA fee.Seller will pay 1st years HOA fee. Listing provided courtesy of Utah Key Real Estate Southern.